Look up during winter’s short days, and you might be lucky enough to see the World’s Tallest Water Sphere. Of course you must be somewhere near Union, New Jersey, and you must be looking sometime during the shortened daylight hours. The current “ghost gray” paint scheme of the tower goes particularly well with the gray skies and foggy winter mists. Look again at this unusual photo. It is not the actual WTWS, but an incredible simulation. 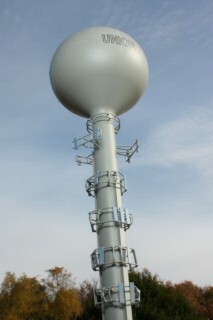 This is the latest model of the WTWS to enter the World’s Tallest Water Sphere Museum. The model is an HO scale (1/87th) plastic styrene model and stands over two feet tall. Notice the ghost gray paint scheme circa 2008. Note the array of five rings of cell phone antennas. Note the halo collars up near the sphere. The array of support hardware and antennas were particularly unique and required many feet of brass wire, styrene strip plastic, and epoxy to complete. Enjoy. This entry was posted on Saturday, December 13th, 2008 at 11:01 am	and is filed under Art, Photos. You can follow any responses to this entry through the RSS 2.0 feed. Both comments and pings are currently closed.